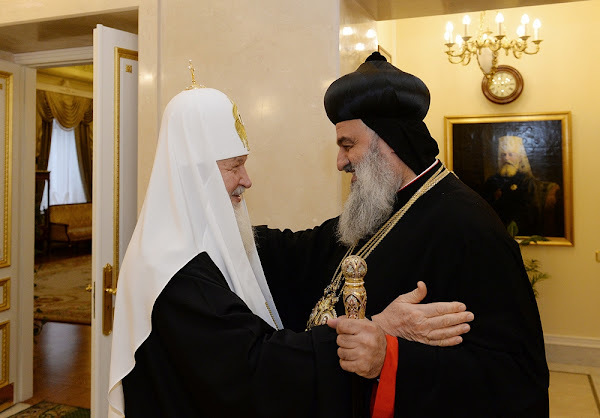 (mospat.ru) - On 10 November 2015, His Holiness Patriarch Kirill of Moscow and All Russia met with the head of the Syriac Orthodox Church, His Holiness Patriarch Mor Ignatius Aphrem II. They were joined in the meeting, which took place at the Patriarchal residence in St. Daniel’s Monastery, by Mor Severius Hawa, Metropolitan of Baghdad and Basra; Metropolitan Mor Dyonisius Jean Kawak, Patriarchal Assistant and Director of the Department of Ecumenical Relations; Archbishop Mor Philoxenus Yusuf Cetin, Patriarchal Vicar in Istanbul and Ankara; Mor Nicodemus Daoud Sharat, Archbishop of Mosul; Very Rev. Raban Roger-Youssef Akhrass, Director of the Syriac Studies Department; Very Rev. Raban Joseph Bali, Patriarchal Secretary and Syriac Media Office Director. The Russian Orthodox Church was represented by Metropolitan Hilarion of Volokolamsk, chairman of the Moscow Patriarchate’s Department for External Church Relations (DECR), his deputy archimandrite Philaret (Bulekov): and hieromonk Stefan (Igumnov), DECR secretary for inter-Christian relations. The Primate of the Russian Orthodox Church welcomed Patriarch Mor Ignatius Aphrem II and his suite and noted that it was the first in the past twenty-seven years visit of the head of the Syriac Orthodox Church to the Moscow Patriarchate. The last visit was paid in 1988 when Patriarch Mor Ignatius Zakka I visited Moscow and took part in the celebration of the Millennium of the Baptism of Russia. The relations between the two Churches began to develop in the second half of the 20th century, His Holiness Kirill said and added that it would be erroneous to believe that there had been no contacts between the Russian Orthodox and representatives of the Syriac Orthodox Church before that time. “Right after our ancestors had become Christians, many pilgrims headed to the Middle East. There, on the lands of Syria, Palestine and Iraq our people who visited the holy sites met with your Church. These contacts were made on the level of human hearts, on the level of experience and introduction of pilgrims to the life of your Church,” His Holiness said, adding that any time in history when the life of Christians in the East was threatened, Russia considered it her duty to help them. The Primate of the Russian Orthodox Church cited the horrible statistics about of Christians who died, were persecuted and uprooted from their homes. His Holiness Patriarch Kirill expressed deep concern over the fate of Metropolitan Mor Gregorios Johanna Ibrahim whom he has known for several decades. Metropolitan Mor Gregorios Johanna Ibrahim and Metropolitan Paul of Aleppo, a hierarch of the Orthodox Church of Antioch, were abducted by the extremists in northeastern Syria over two years ago, and there is no reliable information about them. It is unknown whether they are alive or not. His Holiness Patriarch Kirill mentioned his visit to Syria and Lebanon in November 2011, when the conflict has already begun: “I met with the leaders of Christian communities, and our brothers Christians openly said that the consequences of this war could be awful for Christian population. While in Lebanon, I was surprised to hear from representatives of Christian communities that had been traditionally connected with the West that the West had abandoned them, not defending them, saying nothing of Christians who had not been traditionally connected with the West.” His Holiness added that these words had deeply moved his heart and urged him to do anything possible to mobilize people to defend and support Christians in the Middle East. The Holy Synod of the Russian Orthodox Church has made several statements on the situation of Christians in the Middle East; His Holiness Patriarch Kirill has spoken about the problem with and leaders of international organizations and the heads of states, including the state authorities of the Russian Federation. In 2013, The Primates and representatives of the Local Orthodox Churches, who attended the celebration of the 1025th anniversary of the Baptism of Russia, addressed Russian President Vladimir Putin with a request to do his best to stop persecution of the ethnic and confessional minorities in the Middle East. “We hope that now, thanks to the active struggle of Russia against international terrorism the situation may change for the better, and I would like to know your opinion on the prospects,” His Holiness Patriarch Kirill said addressing the head of the Syriac Orthodox Church. Also, His Holiness told the high guest about the activities of the Russian Orthodox Church in collecting and delivering humanitarian aid to the region suffering from the conflict. His Beatitude Patriarch John X of Antioch and All the East and the Grand Mufti of Syria, Sheikh Ahmad Badreddin Hassoun, distribute the supplied goods to those needy. The head of the Syriac Orthodox Church said in response: “On behalf of my brothers and myself I would like to thank you for inviting us to visit our sister ROC and Russian nation. We come to you from Damascus, the oldest inhabited city in the world, the city of St. Paul, St. Ananias and many great apostles and saints of the Church. We come to you bringing with us the pains of the Syrian people but also their aspirations and hopes. “We are suffering because of terrorism and extremism that is brought to our countries; the presence of Christians is endangered. “It is not for the first time that we come to Russia at the time of difficulty. This year we commemorate the 100th anniversary of the beginning of genocide against Christians in the Ottoman Empire. His Holiness Patriarch Mor Ignatius Aphrem II thank His Holiness Patriarch Kirill for the letter sent to President Obama about the situation in Syria and for all the activities that the Russian Orthodox Church has been organizing about the Syrian crisis. “Through Your Holiness and the Russian Orthodox Church, which is the soul of the Russian nation, we would to thank the Russian people in general for the support and especially for the military intervention of the Russians. We appreciate the sacrifices and their coming to our aiding in order to help us through this difficult time in fighting terrorism. “We assure you that the majority of the Syrian people are grateful for this sacrifice, and the Iraqi people are looking up to Russia to help them in fighting terrorism. “The suffering of the people is great, both Muslims and Christians are suffering, but specially our Christian brothers and sisters are being targeted not only because they are not siding with the so called revolution and opposition, but also for being Christians, for the their faith. “Hundreds of churches and monasteries, some of them very ancient, of the 4th-5th centuries, are being destroyed, and thousands of people have been killed. “Last week I was visiting an ancient town of Sadad mentioned in the Old Testament where a Syriac community numbering almost fifty thousand people lives. This town was attacked by a Muslim group in October 2013; forty eight people were killed. The town was liberated by the Syrian army, and people went back. However, last week that town was again threatened by the ISIS dash which took over another small town in the area; the St. Elijah monastery of the 5th century was destroyed. We were able to remove the elderly people, women and children outside of the town, and young people remained there to defend it. His Holiness Aphrem II said that more than 40% of Christians had already left Syria, mostly illegally, by risking their lives. “This has great affect on us as a Church, as a community. Our people are losing hope and they ask themselves: do we still have a future in the land of our forefathers where they had lived for thousands of years before Christianity, during Christianity and since the coming of Islam. The Primates discussed prospects of bilateral dialogue that could make discussions between the Orthodox and the Ancient Oriental Churches held in the framework of the official theological dialogue since the late 1980s, more active. Also touched upon were other aspects of possible cooperation between the Russian Orthodox Church and the Syriac Orthodox Church.